Up to 1987, the 9 was the only cross-town service along Broadway. and started to have runs to UBC only after University Bld got Trolley wires in 1988. The bus 31, was a typical rush hour only express service with pick up only at all local bus stop East of Oak, for the West bound direction (and drop off only for the east bound), then non stop to UBC. It is the first time Broadway has an uninterrupted service from Boundary to UBC, and service extendining on Lougheed Hwy up to Lougheed. 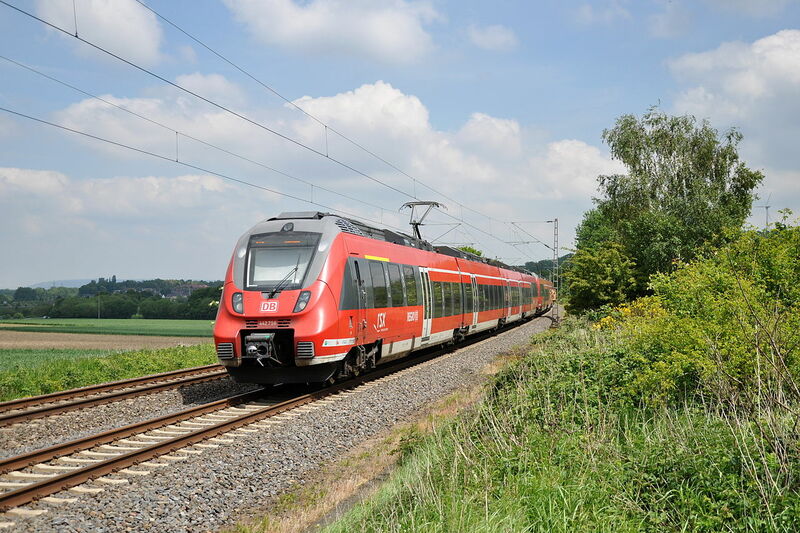 The preliminary service is weekday only, but is running all day long (without evening serice), and receives a special branding: the “Bee Line” logo. A new fleet of 21 low-floor articulated buses with a distinctive B-Line paint scheme and bike rack was deployed. All that were novelties on the Vancouver bus system in 1998. Service is extended on week-end and evening . The Brentwood-Boundary loop route (109) is then discontinued. The buses looking “different” don’t get unnoticed by drivers. Where it was ~37 bus stop between Commercial and Alma (route 9), the 99B was offering only 6 (now 8) along the same 8.5km segment. The B line, especially in its eastern part (pre millenium line), is conceived as to be feeded by local buses. 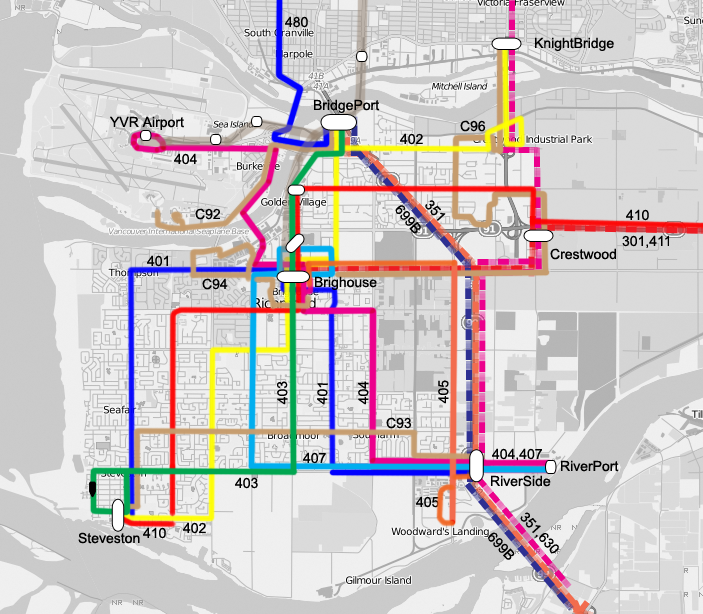 The route 44 (limited stop from down town to UBC), having replaced the express route 85 (local on the downtown peninsula, then non stop up to UBC) participate from the same philosophical approach as the 99B. Vancouver’s BLine Experience, Jeffrey Busby, TRB Annual Meeting 13 January 2013. Cyclist beware: We are talking of the most dangerous road in whole Canada. 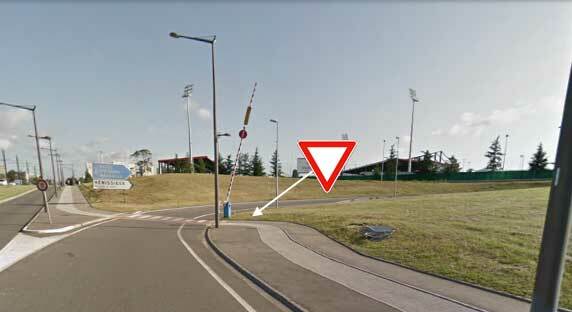 The bike lane is mandatory, says the sign, posted 350 meter after the beginning of the concrete barrier (in black on map): Does cyclists are really expected to jump onto the barrier? The concrete barriers start at Richmond Bridgeport interchange: to be on the right side of it, suppose to cycle on the Richmond sidewalk: that is illegal! 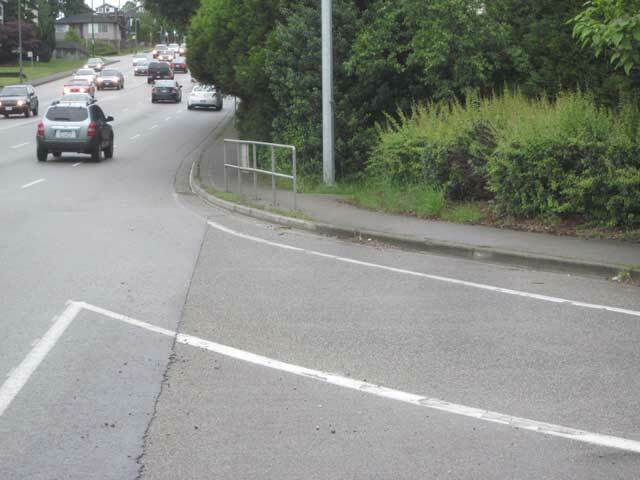 East side bike lane, merging to Knight Street in Vancouver: Welcome to the real world (the most dangerous intersection in Canada say the medias)!- Where the handrail stands is the entrance of a trail joining 64th avenue: cyclists are discouraged to use it. 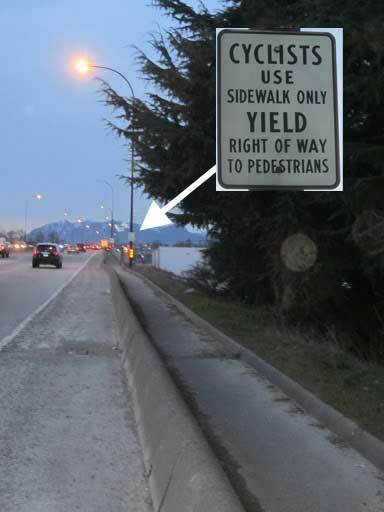 Did you know that bike are not allowed in bus lane in BC? 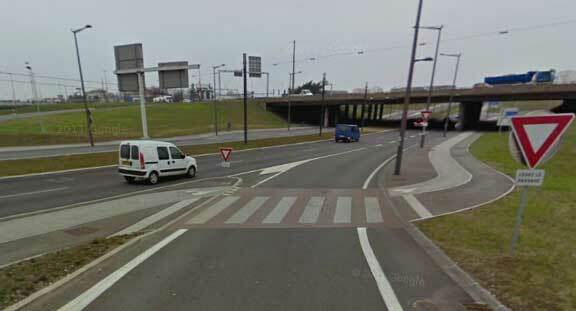 following the sign is both illegal (breaking solid lines) and pretty unsafe on this exit ramp. 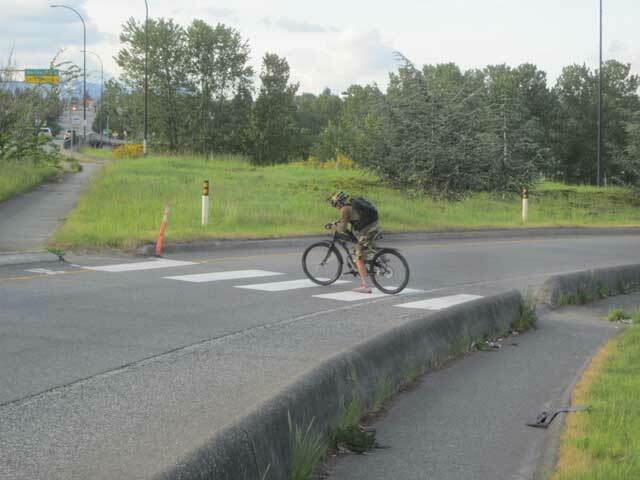 That makes the ride much more cumbersome, and not any safer: gaining momentum from a standing position, require lot of energy, and attention, which is then not focused on traffic as the cyclist in the above picture illustrates. 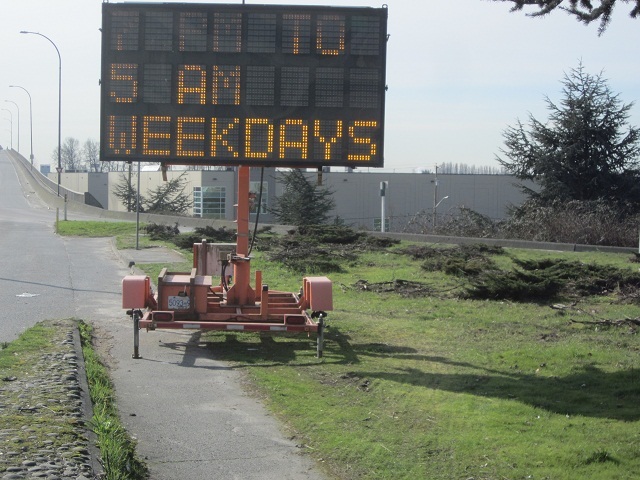 Sign on Knight bridge, at Mitchell Island interchange, resting in the middle of the pathway, also advertised as a bike lane. 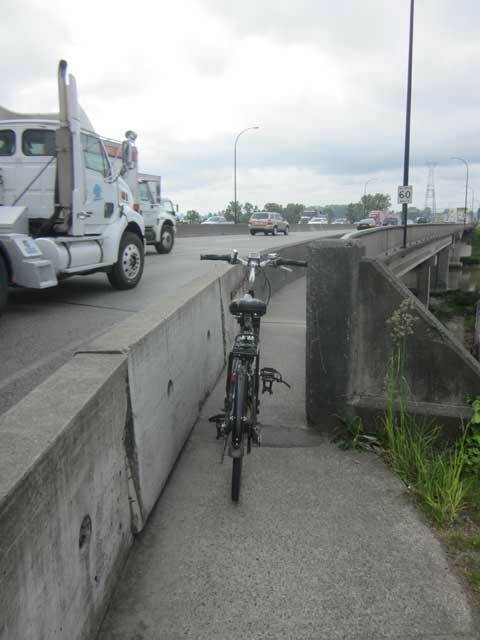 or eventually lost cyclists on the bridge (also breaking the law), may be mislead by some cycling maps, presenting the Knight bridge cycle tracks are the same as the Stanley park bike path! Cyclist, beware, don’t trust the cycling maps! 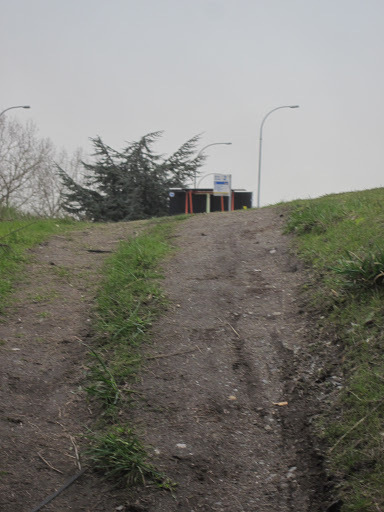 The arduous trail to the Mitchell island bus stop SB: muddy in winter, dusty in summer, slippy all the time! As you probably know, The Translink commission is inviting comments from the public on the proposed fare increase, and particularly on TransLink’s efficiency (The deadline for sending them is February 15, 2012). This post is part of my contribution toward it, and I encourage you to share yours too. 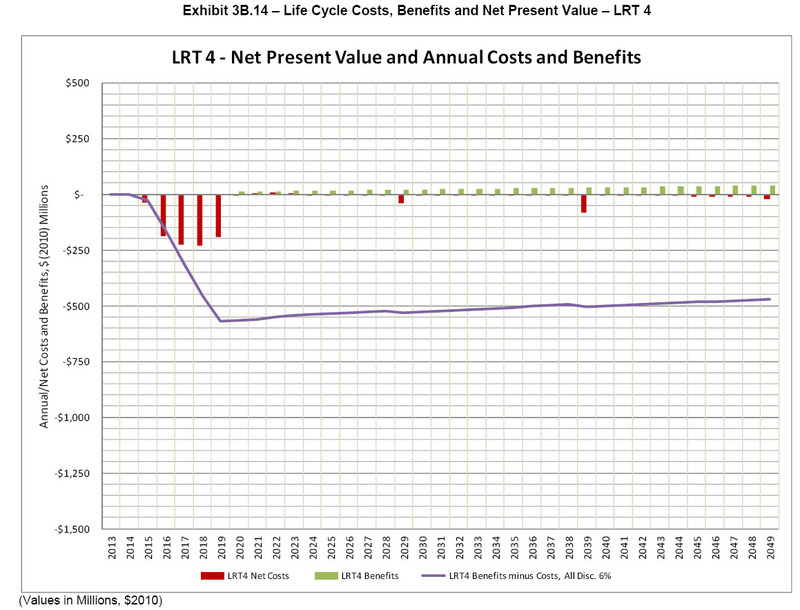 The saving can be very dramatic, and in the case of route #3, it could have allowed a 30% reduction of the bus fleet. 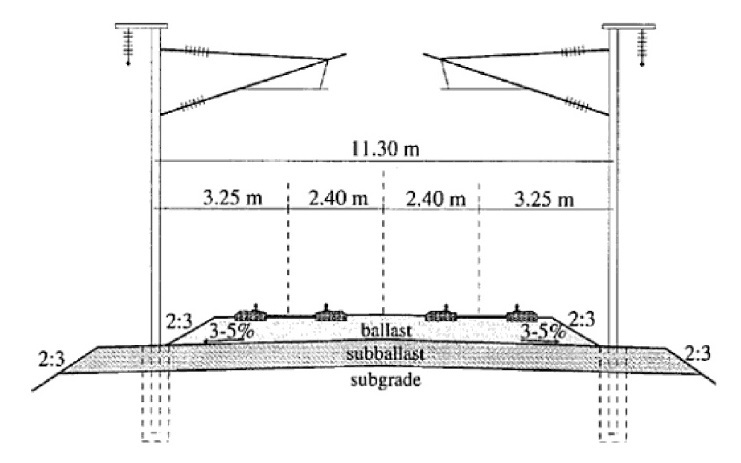 One of the reason for that is expressed by the average speed diagram below. This fact makes also for a low reliability route. The additional observation that most customers transfer to/from SkyTrain for downtown access and ridership in downtown and Hasting is pretty light-an observation corroborated by Translink ridership analysis – complete the justification of the short turning of those routes South of Hasting (instead to head toward downtown). Those route could then operate on a nearly pure grid system- Hasting street being served by route 14,16 and 135 among others on nearby parallel corridors. The lack of direct service to downtown is largely compensated by the Skytrain access: In that matter, those routes could not be treated more differently than the suburban bus routes (which have been short-turned with the advent of the canda line for similar reasons). Furthermore It is also worth to note the route 19 still ensures a direct connection between downtown and Main, north of Broadway. This Hub allows connection with the Richmond network -route 405,407 and 430- , which legitimates the extension of route 8 and 20 toward it. Since there is no bus loop, and the number of runs on route 8 and 20 are roughly equivalent, the buses of route 8 could continue on route 20 in the same manner as buses operates on route 5/6. It replaces a diesel bus by a trolley can’t be bad! 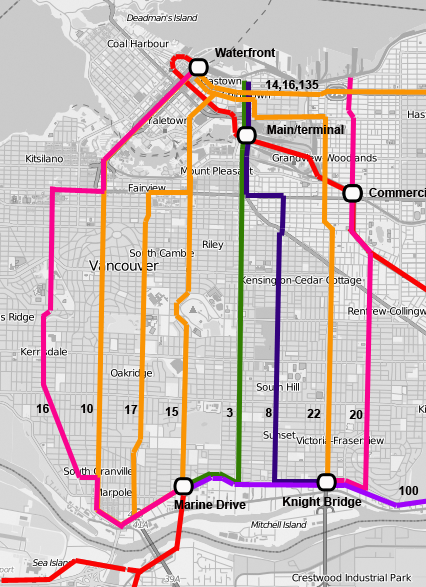 It allows to retire the route 16 bus loop-as well as Marpole loop-which can be sold (what can probably pay all the work required for other operation suggested in this post). While, the proposal improves significantly the connectivity of the network, the average daily operating hour saving-120hrs- could be still around 18% , what is probably worth $5 millions/years (assuming operating cost of $120 per vehicle.hr), leaving significant room to improve other part of the system. 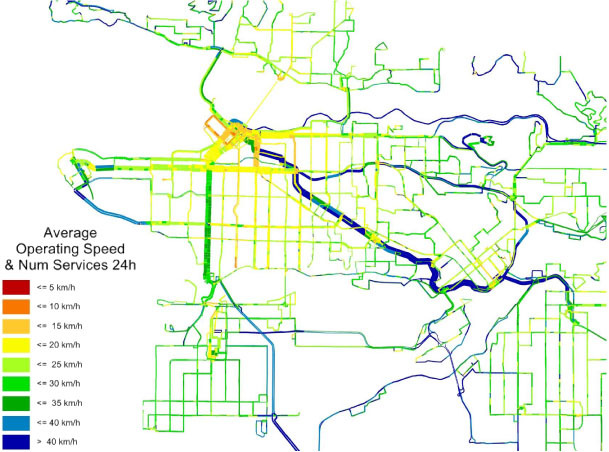 Vancouver/UBC Area Transit Plan , Translink, July 2005. See also our suggested Transit plan for Richmond (September 2, 2011). But, the real story is not so much the pedestrian scramble than the new traffic light which will have certainly consummed the bulk of the $600,000 budget allocated to this intersection “improvement” . 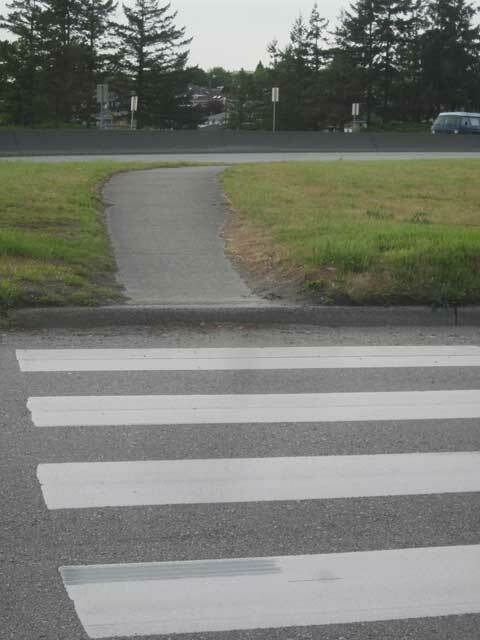 The opportunity to improve the pedestrian experience, this by installing bulges, narrowing the roadway has not been taken. both pedestrian and vehicular traffic could become fairly heavy in some summers week-end, but nothing comparable to what we can witness in Granville Island at anytime. 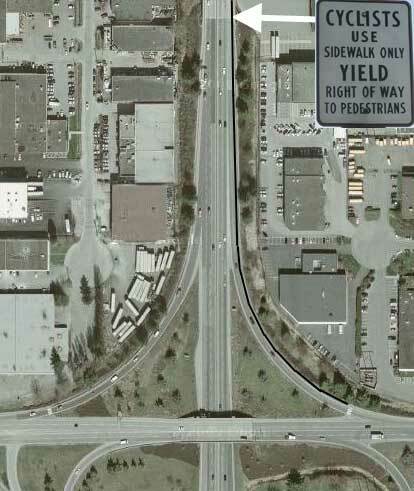 The consequence of the last observation is that right and left turn traffic can be impeded by the pedestrian traffic…The Richmond traffic engineers will have found, that blocking all pedestrians movement during vehicular movement was the best thing to do…and here is the rational for the scramble. It is sold to the public as follow: The previous configuration (4 ways stop), where politeness’rules applied (i.e. 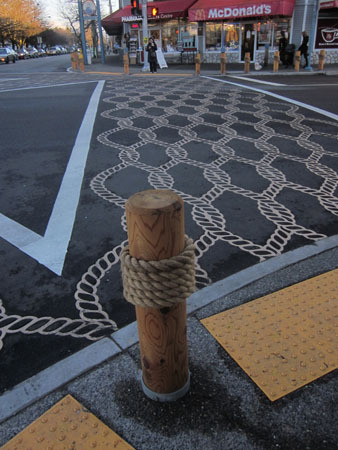 like in Granville island), was judged “confusing” by the Richmond traffic engineers . 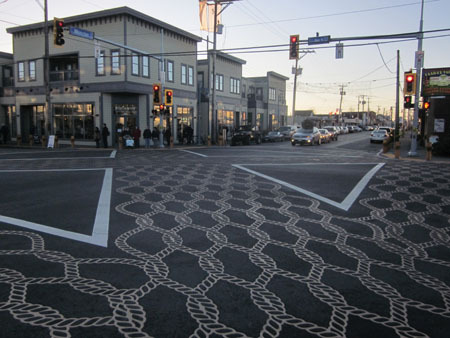 If you believe that the lack of rules for pedestrian is creating congestion in Granville and makes it unsafe, you will cheer for the Richmond’s “traffic improvement” as a step in the right direction. No.1 Road and Moncton Street Intersection and Surrounding pedestrian crosswalk improvments Victor Wei, Transportation department, April 21, 2011, Richmond CA. Notice that this lst reference states that “based on the pedestrians and vehicles traffic volumes, a a traffic signal is warranted at this intersection” without substanciating those “volumes”. 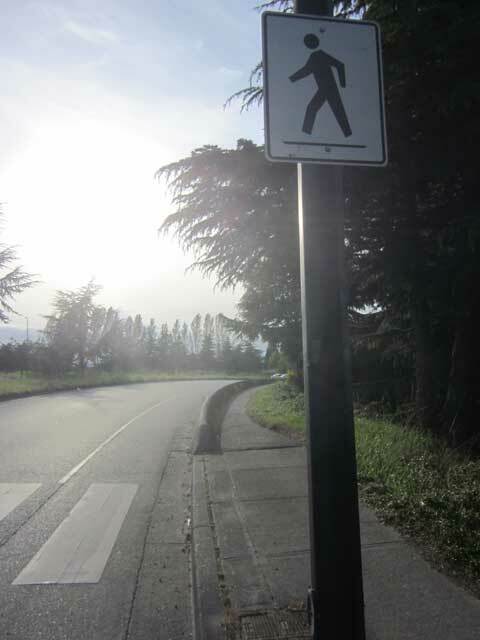 A reference is done to a mysterious study (Stevenson Village Traffic and parking improvement, Victor Wei, Transportation department, August 31, 2009) which didn’t provide any substance either. 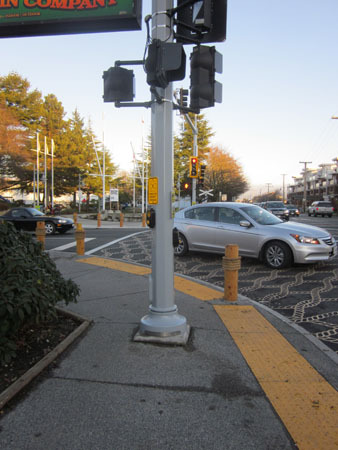 Pedestrian Crosswalk Improvement Project, Communication from Richmond CityHall, 2011. 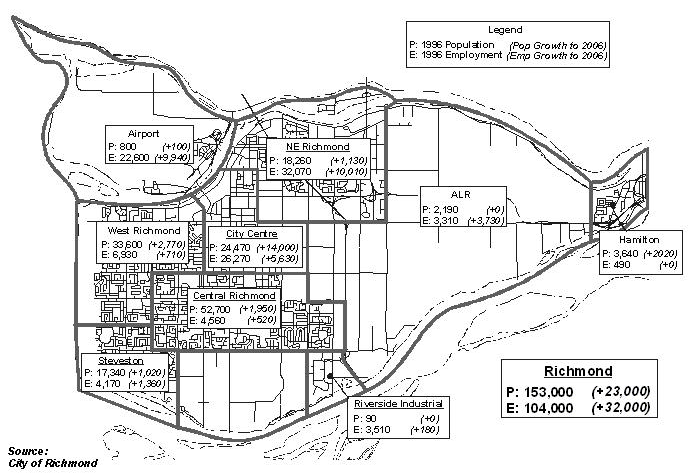 Translink, had drafted a transit area plan in 2000 for Richmond  and most of the ideas proposed in this plan have been implemented in the subsequent years. As mentioned in a previous post, the advent of the Canada line has left relatively untouched the local transit network in Richmond, even when some route, touted as express, like the 430 are now slower than other options using the Canada line. The short cutting of the 480 (terminus at Bridgeport instead of Brighouse) is the only noticeable exception. That is part of a terminus swapping with route 407. It also apriori allows 403 to travel denser part of Steveston Hwy, making better usage of its high frequency along this corridor. The route followed by 407 along Westminster Hwy allows it to connect with all other local routes, as well as route 301,411 so it doesn’t need to loop at Brighouse. We then prefer Landsowne since it increases the transit covered area. So doing, the route C96 can offer a quick access to Number 6 road from Brighouse (10mn instead, of 23mn by the 410 or current C96) and able to contribute to relieve more efficiently the 410 (in association with the redesigned route 301 and 411). 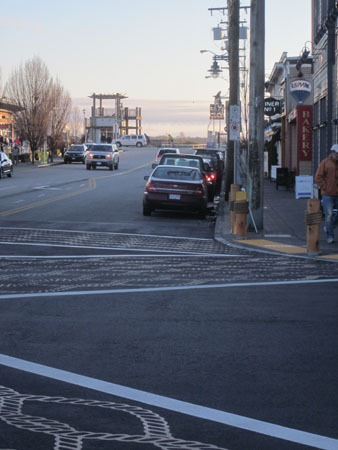 Notice that the current Steveston interchange design doesn’t allow the buses to U turn. The loop at RiverPort costs 4mn returns, which can amount to a significant expense (30hrs if all the route named terminate at RiverPort instead of Riverside) so some roadwork improvements could be required here. At this time, it connects Richmond with Vancouver routes 22 and 100. The connectivity could be much better by extending Fraser route 8 and Victoria route 20 to Knight Bridge, but that involves numerous challenge, so at this time it is a secondary hub in waiting to be developed. For each major axis, one bus route. 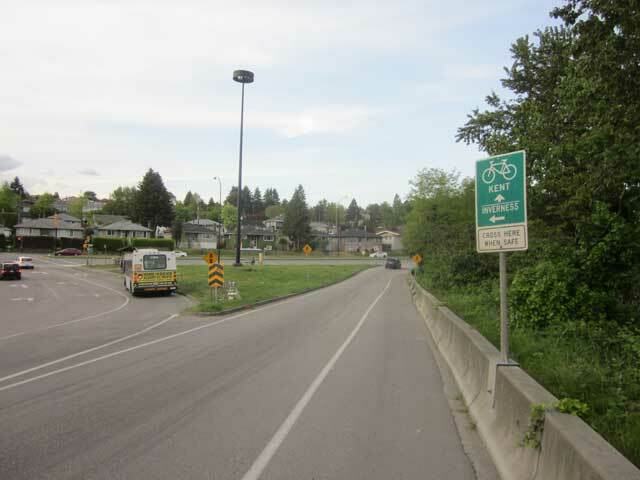 While Route 405 connects Cambie with Knight Bridge, we can consider it is not the most efficient way to provide the connection due to the high level of redundancy between route 405 and 410 on Cambie, both going to Brighouse. The idea is to suppress the route 405 north of Brighouse – that translate in a saving estimated at 31hrs. The redesigned routes 301 and 411 addresses potential crowding problem on current route 410. 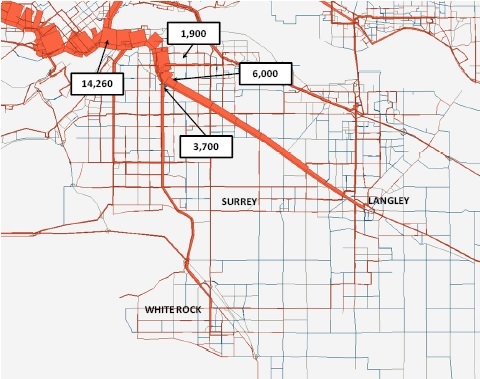 A revamped C96 addresses the connectivity issue between the Cambie area, and more generally North Richmond and Knight Bridge. South of Williams, route 410 made a detour to service the residences at Garypoint. One has to consider that the cost of this detour by the very frequent route 410 has become prohibitive in regard of the served market. Also, so doing, the route 410 avoids the recently developed and now much more populous area along Moncton street, between Railway and route Number 1. That is the reason why we prefer to keep The route 410 along Railway down to Moncton- that translates in a saving of 7hrs. A slightly less frequent bus, 403, can still serve Garypoint. Garden city (North of Westminster Hwy) is mainly serviced by the bus 407. The service on this corridor is pretty poor, with a bus 407 per hour most of the day, this in despite of an high job density along a corridor anchored by Bridgeport station. This corridor is serviced by route 402 for reasons previously stated. 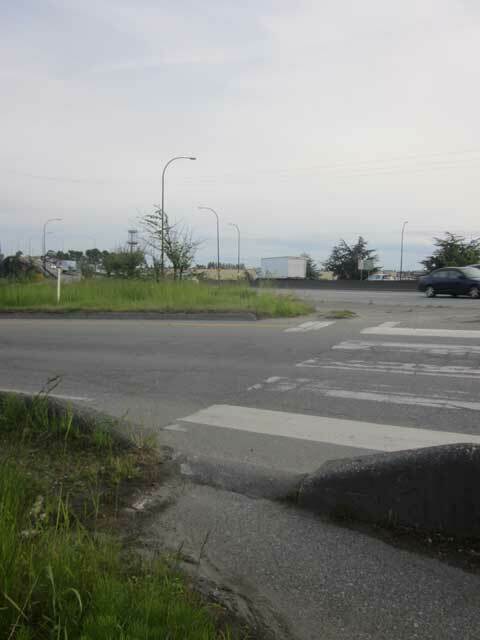 the detour along Vulcan becomes the main route, this to allow a connection with the route 630 (Ladner-Metrotown). That is kind of odd, since it is a main axis in Richmond. It becomes serviced by route 405 and 407. Today, it is partially serviced. East West travel along it is not really possible due to a “missing link” between number 3 and Gilbert. C93 along Williams provides the East-West connector in South Richmond. A swapping of terminus, between routes 403 and 407, provides a Transit continuity for people traveling along Steveston Hwy, and could call for a reduction of the C93 service if necessary, if not the complete discontinuing of this route. The swapping makes the route 407 a bit longer (+1mn per run), but the route 403 a bit shorter (-1mn per run): because the route 407 is less frequent that the route 403, it results in a total net operating saving. It is one of the major weakness of the current local network: Richmonites can’t easily access the airport, a major source of employment for locals. To correct it, some runs of the route 404 are extended to the airport. One could have considered extending route 301 or 411 could have been more judicious since airport is also a regional destination, but here the route addresses also a local market (Bukerville access). This area is very well connected to Brighouse, with a bus every 2-3mn in peak hours, but does this high level of service is visible to the transit rider? Modifying a bus network is always gonna to hurt some sensibilities, and the few riders affected by a bus change will always be more vocal than the more numerous new customers. 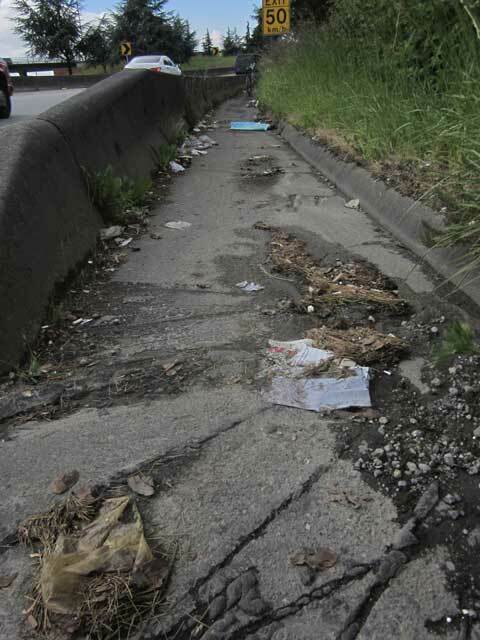 That has been verified by the pruning of route 601 at Bridgeport, but it is not something undo-able. 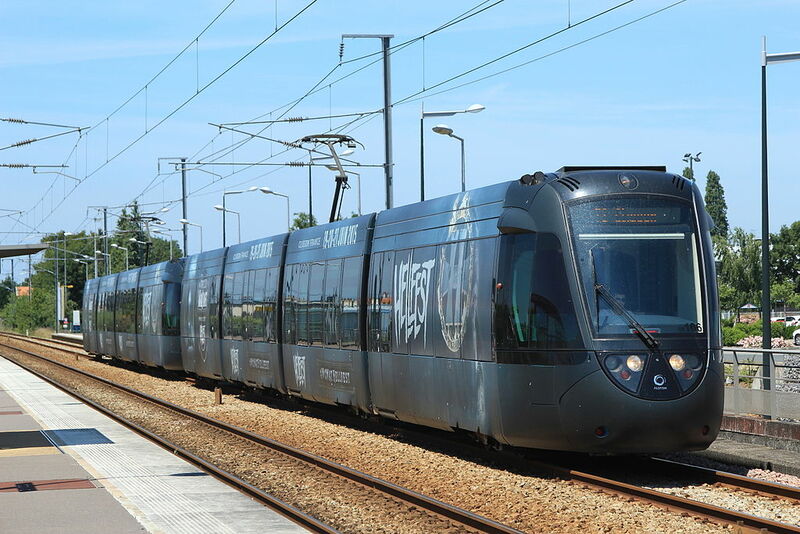 The Lyon transit agency in France did it this year, and one could argue that the budget neutral network reorganization is something sensible to do in time of fiscal restraint. The more frequent is the bus route, the more relevant is the route reorganization, but the more complex it becomes since the more customer habit it can hurt, so it is better to be done sooner than later.